When the hypocrites and accomplices to Adolph Hitler (Matthew 7:21-23) would sing praises to Jesus in the protestant churches in Germany, they would sing louder to drowned out the noise of the Jews, Gypsies and dissidents that were crying out for help while they were being hauled off in cattle cars to concentration camps, or even worse, extermination camps (Psalm 78:9). When church services were over they would find their cars toppled with the ash of the bodies that were burned in the incinerators. To further the atrocities of these traitors to Christ, they were the ones handing off their youth groups to do Hitler’s killing for them. These professors loved Jesus so much that they simply disobeyed His commandments at every opportunity that they had (1 John 2:4). Martin Niemöller is perhaps best remembered for this quotation I have heard this quote many times before, but it was just recently that I learned that the man who said it was a prominent protestant pastor during the time of Hitler and the Nazis. It was learning this fact that made all the difference in the world in understanding where this quote stemmed from. This quotation stemmed from Niemöller's lectures during the early postwar period. His point was that Germans and, in particular, the leaders of the Protestant churches had been complicit through their silence in the Nazi imprisonment, persecution, and murder of millions of people. "Thus, whenever I chance to meet a Jew known to me before, then, as a Christian, I cannot but tell him: 'Dear Friend, I stand in front of you, but we cannot get together, for there is guilt between us. I have sinned and my people has sinned against thy people and against thyself.'" What he would of and could of changed if he himself and all of the Church leaders in Germany took a stand and spoke out against Hitler and the Nazis when it mattered most. Although he did suffer, spending the last seven years of Nazi rule in concentration camps, he still recognized his own guilt for not speaking out against tyranny. First they came for prayer in school, and I did not speak out—Because I was not a student. Nor did I ever look into the fact that the Supreme Court is not above the law (Article 3, Sections 1 of The United States Constitution (Ephesians 6:18)). 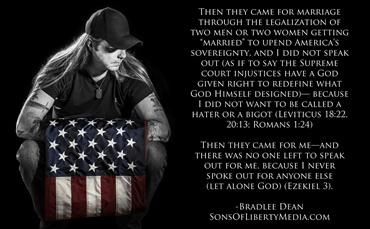 Then they came to murder the unborn in their mother’s womb, and I did not speak out— Because I was not an unborn child. After all, I was told that the Supreme Court could sanction the murder of the innocent in the womb by simply calling it a woman’s choice (Proverbs 6:17). Then they came for me—and there was no one left to speak out for me, because I never spoke out for anyone else (let alone God) (Ezekiel 3). It is disgraceful what we are not seeing from the pulpits in America today. Rather than seeing a thunderous barrage of righteous indignation against murder of the unborn, and zeal against tyranny, injustice, immorality, we are hearing virtually nothing from over 300,000 pulpits…silence (Zechariah 1:15). We hear Church leaders (1 Corinthians 12:28) say, “Well, I don’t speak out against anything political.” The murder of innocent children, political? Homosexual marriage, political? A corrupt, wicked, and lawless administration that means to destroy your country and religious freedom, political? Here we see in Niemöller, a man who could not change the destruction that took place in the lives of millions of people. Prevention would have been better than cure. He could not go back in time and right the wrongs, but America still can. Together, we can turn this destruction around, but if you choose to remain silent, don’t be surprised when they come for you and there is no one left to speak out. And at that point you can rest assured that others may sing loud enough to drown out your cries.